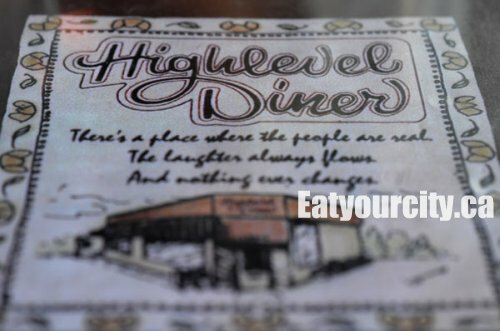 Hankering for a homestyle meal, we head to the High Level Diner where we knew we could get a tasty homestyle meal in a superly laid back setting. 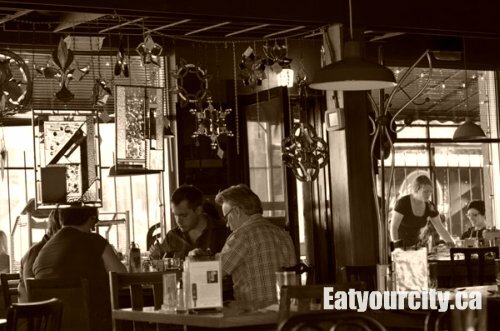 Frequented by students, families and couples on a date, you have the choice of basking on a sunlit patio, or a cool dim dining area with dark wood tables burnished to a golden shine by customer's knees in some areas, with sunlight filtering through hanging stained glass pieces. Service is prompt, friendly, super enthusiastic, and we plunk down into the dining room since its super windy out, rather than fight with flying napkins out on the patio. With a lazy bee making its rounds in the flowers outside, we start flipping through their extensive menu. 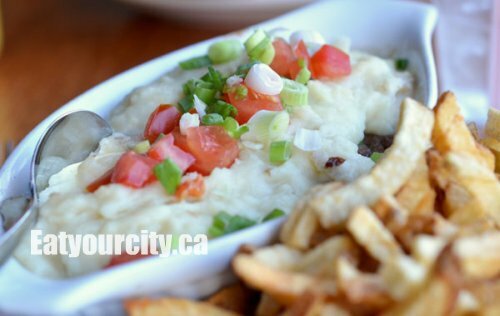 Being in the University area, High Level Diner has homecooked meals ranging from sheppard's pie, burgers, hummus, spanakopita to enchiladas, with a focus on using locally sourced foods, organic items and a good selection of gluten free choices. We just missed the start of the turkey special - every "Turkey Tuesday", they will be serving a turkey burger with mango chutney and the works. Turkey burger, I'll see you next week! Where are the perogies? On Ukrainian night every Thursday, you can get a perogies, sour creme, sausage, cabbage rolls, and borst soup fix. For those with Celiac disease, fear not, every 2nd Thursday of the month you can get a gluten free Ukrainian dinner! With a huge variety of drinks, it took us a while to narrow things down. There's a wide selection of wine, specialty beers (imported, organic and flavored), cocktails and smoothies. We went with Crabbie's Ginger Beer (alcoholic) and High Level Diner's mango frappa. 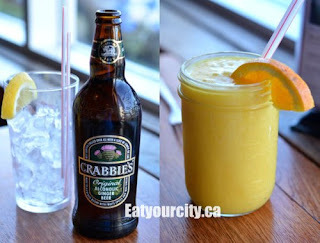 Crabbie's Ginger Beer tasted like a super light and smooth pale ale with a generous shot of ginger syrup added to it... Mmmm! The mango frappa was a refreshing smoothie with sweet mango, fresh orange juice, yogurt, a small touch of honey and ice blended into a cool delicious yumminess... served in a jam mason jar! If I had this hiding in my jam jars at home, I'd be very very pleased. Sluuuurp! Having your tummy growl while you're looking at the menu tends to mean you end up ordering too much food, so being only the two of us, we ordered two entrees each, knowing that High Level Diner's portion sizes are anything but tinny. When you're craving homestyle food, nothing quite beats a homey Sheppard's pie to hit the spot. Lightly seasoned lean ground beef enveloped in a not overly rich (and not overly salted) gravy with sweet peas hidden here and there. Its topped with a fluffy mound of mashed potatoes - oddly without a baked top but with a handful of diced ripened tomatoes and green onions, but tasty none the less. Served with a choice of fries, salad, tabouleh, or soup, we went with fries cuz High Level Diner makes their own ketchup.. a smooth super tomatoey ketchup. Sploot splot.. dunk... Mmmm. 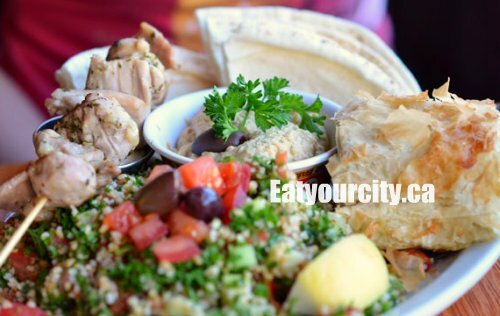 The term appetizer is a bit of a misnomer, as the platter comes out with full sized servings of everything: hummus, tabouleh, a grilled chicken skewer, a huge chunk of spinach pie, taziki and a handful of pitas. The hummus was flavored with a bit of cumin, smooth, dotted with a few olives and grows on you as you nosh through the meal. The pita bread was disappointingly hard and getting on the stale side. The tabouleh is tangy and refreshing with plenty of parsley, diced ripened tomatoes and crunchy crisp bulgar bits. I like mine with a bit more lemon, so I gave the lemon wedge a good squish over the tabouleh. The chicken is lightly seasoned with oregano, garlic and lightly grilled into succulent tender morsels, perfect with the cool creamy thick cucumbery taziki. The spinach pie - a take on spanakopita - a huge chunk of lightly feta'ed chopped spinach is wrapped in phyllo pastry. The phyllo was a little mushy rather than flakey crisp, and the spinach could use a bit more feta (or a stronger goat feta) to up the flavor, but this milder homestyle version is comforting in its own way. Overall, a nice relaxing homestyle meal in a laid back and friendly setting. We ran out of room for dessert... they have a variety they make in house - pies, cakes, a few icecream and gelato choices from Pinocchio's, and a bread pudding they make with their cinnamon buns. Bread pudding... I'm seeing you next week too! do your waitress' wear cute old fashioned diner dresses? lol... not that we recall. Just casual t-shirt and jeans... but they weren't hard on the eyes either :) You can always suggest it to the owner!